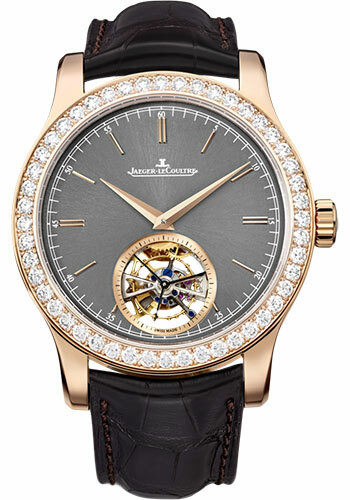 43 mm pink gold case, 13.31 mm thick, transparent back, diamond bezel, slate-gray dial, caliber 978 automatic movement with hour - minute, seconds and tourbillon, approximately 45 hours of power reserve, black leather strap, pin buckle. Water resistant to 5 bar. 43 mm white gold case, 13.31 mm thick, blue dial with sprinkled shavings of silver and gold, caliber 978 automatic movement with hour - minute, seconds and tourbillon, approximately 45 hours of power reserve, blue leather strap, pin buckle. Water resistant to 5 bar.